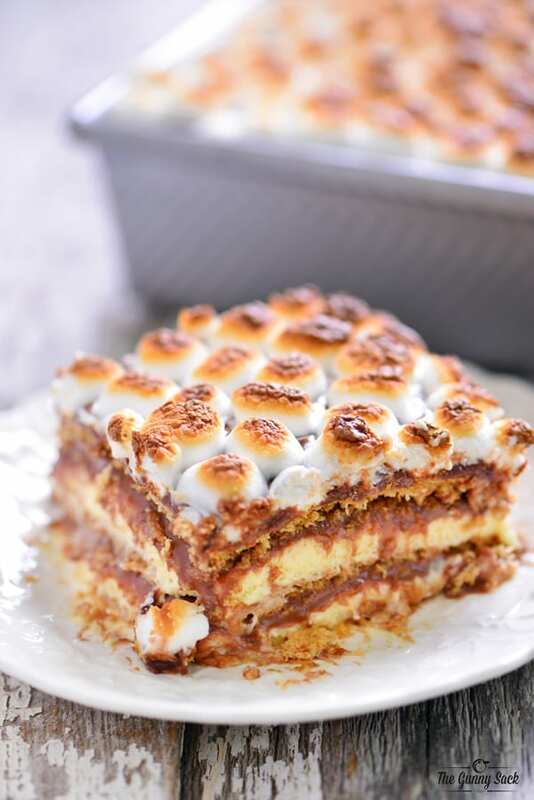 This easy to make No Bake S’mores Eclair Cake recipe has luscious layers of graham crackers, vanilla pudding and chocolate topped with toasted marshmallows. 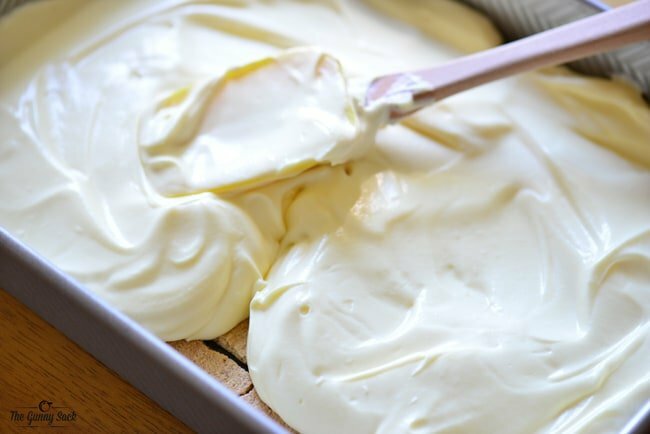 Before I even knew what an eclair cake was, I was making my own kiddy version by sprinkling crushed graham crackers on pudding and topping it with whipped cream. There’s something about the combination of graham crackers and pudding that is perfect. Another thing that’s perfect (and I LOVE using the word PERFECT because a copy editor told me to NEVER use that word, along with the word unique because NOTHING is perfect or unique…according to her and the other copy editors of the world) is that this dessert is no bake and it is prepared the day before so it’s ready to go when you need it! Start by making the chocolate ganache. (You can make all of it in one bowl or use three separate bowls, one for each layer of the cake, with 1 cup of the chocolate chips and 1/2 cup of the whipping cream in each bowl.) Bring heavy whipping cream to a boil and pour it over the mini kisses. Allow the chocolate to sit for three minutes, stir until smooth. Place the ganache in the fridge and allow it to cool and thicken, stirring occasionally. Next, cover the bottom of a 9×13 inch pan with graham crackers. Beat together the instant vanilla pudding mix and milk. Allow it to thicken for five minutes and then beat in the marshmallow cream and whipped cream. Spread half of the pudding mixture over the graham crackers. Pour a third of the cooled chocolate ganache over the pudding layer and spread it out. Add another layer of graham crackers, pudding and ganache. Top with a final layer of graham crackers, more remaining ganache, and the mini marshmallows. 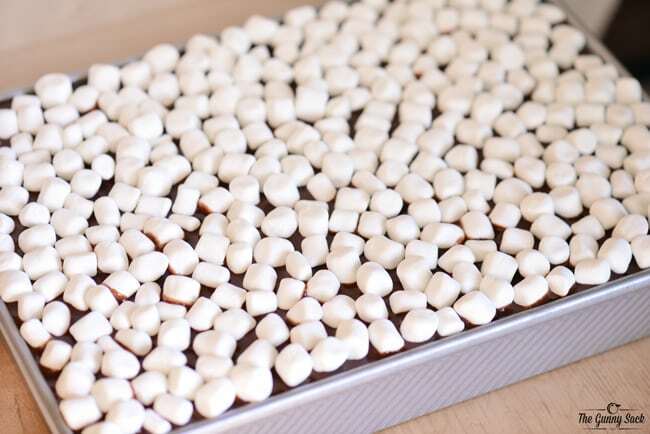 Toast the mini marshmallows under the broiler or with a kitchen torch. 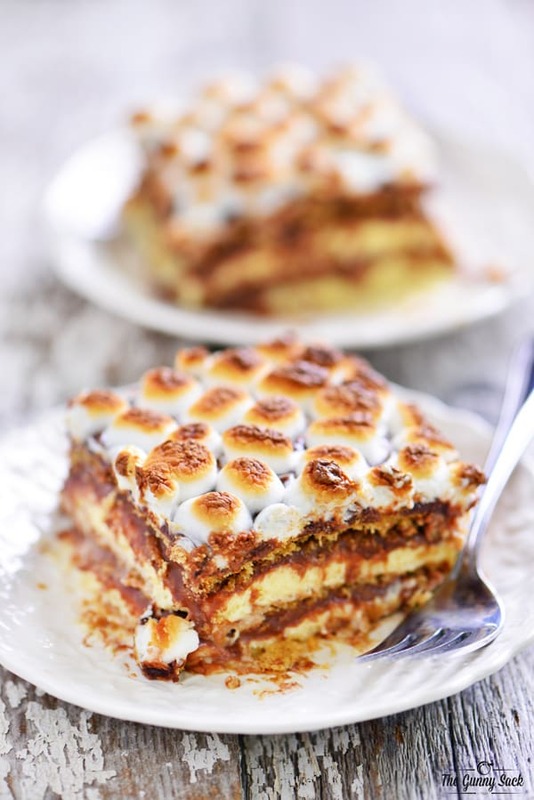 Cover the smores eclair cake and place in the refrigerator overnight so the graham crackers can soften. 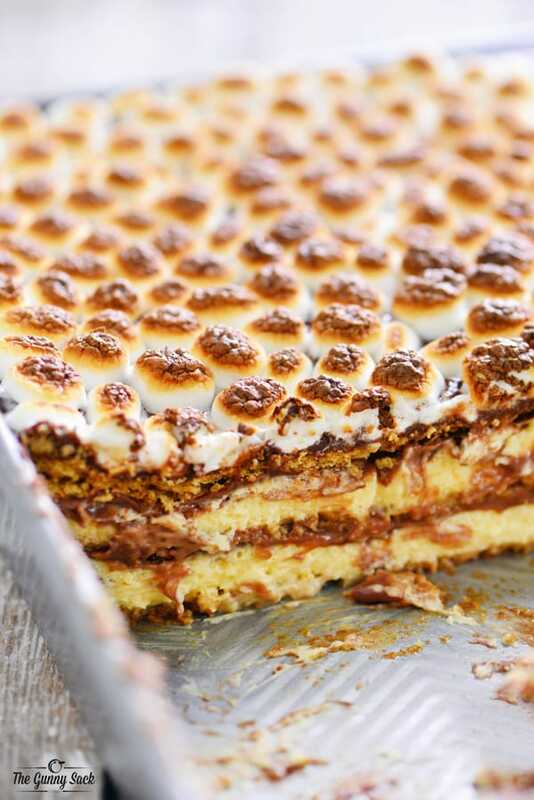 This S’mores Eclair Cake recipe is easy to make for summer parties and backyard barbecues. I love that the dessert is prepared ahead of time so it’s one less thing you have to worry about. Heat the heavy whipping cream until it starts to boil. Pour the cream over the chocolate chips and allow them to sit for three minutes. Stir until smooth. 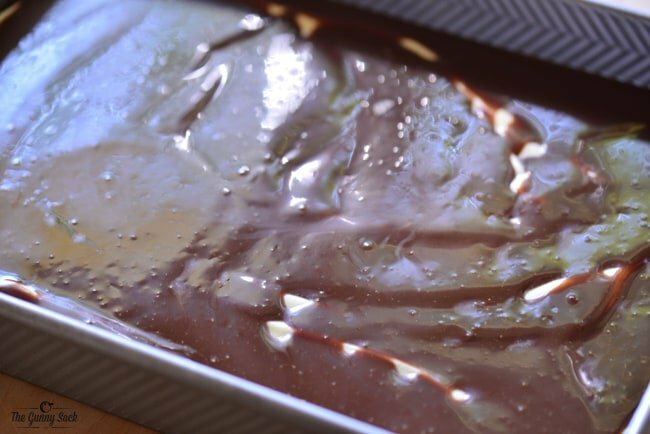 Place the ganache in the fridge, for 30 minutes to an hour, to allow it to cool and thicken, stirring occasionally. Beat the instant vanilla pudding mix and milk for two minutes. Let it thicken for 5 minutes. Beat in the marshmallow cream and whipped cream. 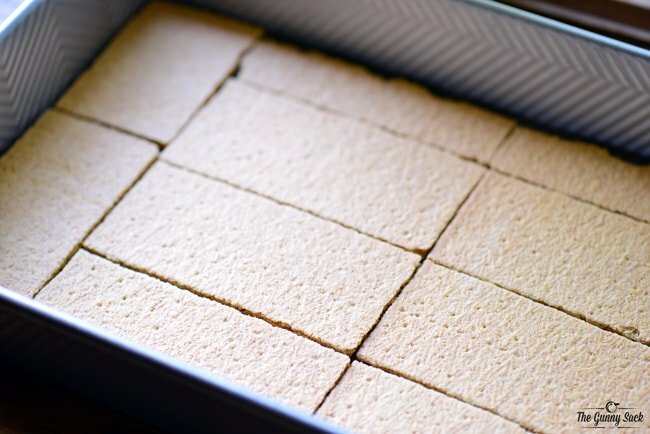 Line a 9x13 inch baking pan with graham crackers. Cut or break the crackers as needed. Spread about 2 1/2 cups of the pudding mixture over the graham crackers. Pour 1/3 of the cooled chocolate ganache over the pudding and gently spread it out. Top with another layer of graham crackers, the second half of the pudding mixture and another 1/3 of the cooled chocolate ganache. Top with a final layer of graham crackers and pour the remaining chocolate ganache over the crackers. Add the mini marshmallows and toast them under the broiler or with a kitchen torch. Follow The Gunny Sack’s board Dessert on Pinterest. 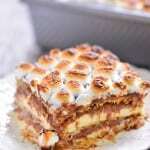 This has to be the best eclair cake I have ever seen! That looks so so good! I think I’m going to have to try that!